The “Begijnhof” is literally “The House of the Beguines” who were a predominantly Low Countries, early Medieval, religious society of lay women. Although devout these women chose not to take holy orders and so weren’t nuns. Instead they chose to live secular lives and many were married women. 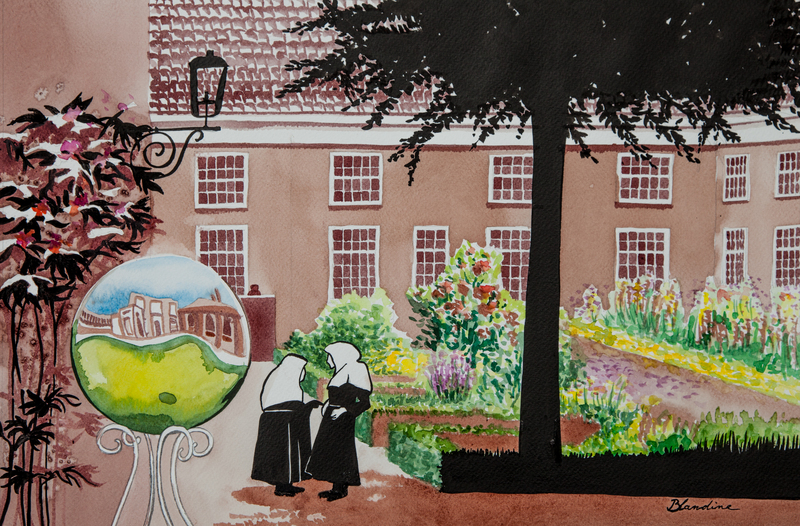 In several towns and cities the Beguines built accommodation to house their single, ageing or poorer members and so hence the origins of Breda’s Begijnhof (or beguinage). This vinorel is painted with local Dutch wine: Dassemus red (Chaam), Sandspuy red and white (Etten-leur), with colours accents from aquarel and black ink voor de shadows.